We have shown you pictures of what appeares to be a full QWERTY keyboard for the BlackBerry Pearl 9100. We also have published a picture of the 9100 with the usual SureType keyboard that Pearl users have become accustomed to using. Now, we have pictures of the Pearl 9105 which looks to be the same exact model right down to the optical trackball-except it sports a T9 keyboard. As we previously reported, T-Mobile is expected to be the carrier that launches the Pearl 9100 in the U.S. where it will be the first RIM model to be equipped with 802.11n Wi-Fi. 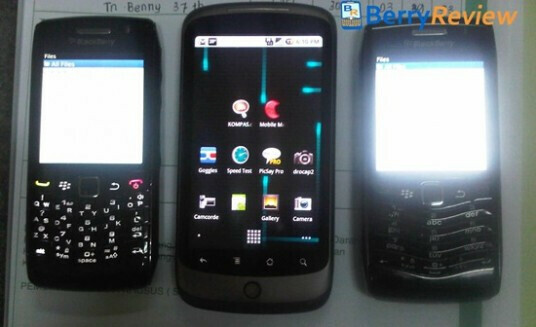 The Nexus One in the middle of the photo looks like it is trying to play peacemaker against two fighting BlackBerry devices. But the big question here is, how does a T9 keyboard strike you Pearl buyers? i want the pearl 9100!!! I hated my pearl, but with a full keyboard it would be cool (as long as the keys are usable). I grew to like the t9 after a couple weeks and after a couple months grew to hate the t9. I quit sending texts / emails and finally switched back to a full size Blackberry. After using blackberries I'd prefer a suretype as opposed to T9. meh..once a CRAPberry..always a CRAPberry! I'd like to see an E52/E55 Pearl shootout.